Gigi, aka Boc's Grand Gold, is a beautiful, petite, 3-year-old red fawn female born July 25, 2004. Her sire is the late Gable Dodge, making her grand sire Wigwam Wag, and her dam is RK I Found Gold. 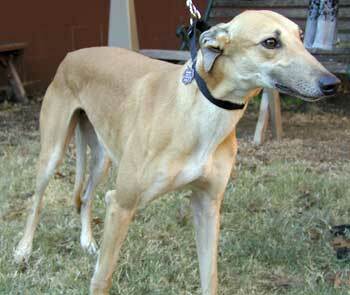 Gigi is half sister to Chase, as well as many other GALT greyhounds who were sired by Gable Dodge. Gigi's racing career of 86 races started on February 16, 2006 at Cloverleaf Tract in Colorado, moving on to other tracks in Colorado, Kansas, Texas and Iowa. It ended on Sunday, November 25, 2007, when she suffered a torn ACL. 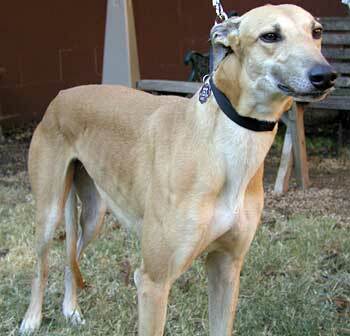 She, along with Chase and Serena, was brought to Dallas by greyhound and GALT volunteers on Tuesday. Dr. Jeff Ellis evaluated her the next day, and she is scheduled for surgery with Dr. Bob Radasch of the Dallas Veterinary Surgical Center on Monday, December 3. 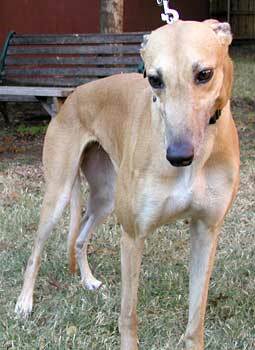 This injury is the first ACL tear GALT has seen in the greyhounds taken into its family. An update will be posted after the procedure. Please keep Gigi in your thoughts. Gigi's surgery went as expected, and she is now in the recovery period of 10 weeks. She is being kept to a very minimal activity level. Gigi has been completely released by Dr. Radash, and is ready to find her forever home!